What Does Entry of Judgment in a Divorce in California Mean? 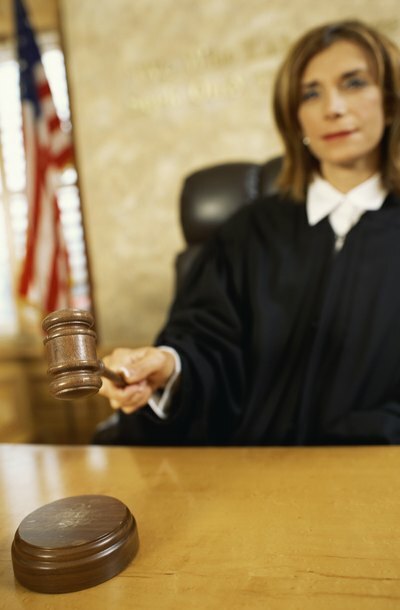 The term "entry of judgment" refers to a court order being entered after the judge rules on a case. In a divorce case, the judge orders a dissolution of the marriage, property division, child custody and support, visitation schedules, spousal support, attorney's fees and any other pertinent issues. The court order contains the judge's ruling on each issue. The attorney or self-represented party submits the judgment and supporting documents to the court clerk to enter. The court clerk enters this court order as a judgment. When you file for divorce and the court hears the case, the court orders a final dissolution of the marriage. The final orders for dissolution are recorded in a legal document and signed by the judge. In California, the actual entry of judgment generally occurs days later by a family law clerk in the court clerk's office. Therefore, the judgment often contains two dates: the date the judge ordered the final dissolution of marriage and signed the judgment and the date the clerk entered the judgment. The divorce takes effect on the date the judge signs the judgment. However, it is not finalized until a court clerk enters the judgment and issues a Notice of Entry of Judgment. In each divorce case, the filing party must file a Notice of Entry of Judgement at the same time as the judgment and accompanying attachments. The filing party also provides two envelopes, with prepaid postage, addressed to each party. Once the court clerk's office enters the judgement and Notice of Entry of Judgment, it mails a copy to each party. The Notice of Entry of Judgment informs each party that the court entered a judgment in the case. The date on the Notice of Entry of Judgment determines the time for appeal. Appeals must generally be filed within 60 days of receipt of the notice, or within 180 days after the judgement issued without receipt of a Notice of Entry of Judgment. An entry of judgment often requires other supporting documents, in addition to the judgment and Notice of Entry of Judgment. The additional documents vary based on the type of case. California divorce cases include "status only judgment" cases, as well as uncontested, default and true default cases. In a status only judgment case, the only issue the court resolves is the dissolution, without property division or child custody. An uncontested divorce means both parties appear and submit a written agreement to the court. Default cases include a written agreement without a filed response. A true default case lacks both a written agreement and a response. Your local family court should have a checklist detailing the required documents to file a judgment in each type of case. The court has a checklist that outlines the additional documents that an attorney, mediator or self-represented party needs to file with the court for an entry of judgment. For example, in default or true default cases, the judgment must be filed with a proof or service, to prove the other party had notice of the pending legal action. The court cannot enter a default judgment if the filing party fails to produce adequate evidence that the other party knew of the case filed against him. Otherwise, the other party would be denied his constitutional rights to be heard on the matter. Dishon and Block Divorce Attorneys: When a Divorce Judgement Is Final How Long Do I Have to Appeal? A divorce decree states the terms of a divorce. The court approves the terms for the divorce based on a divorce settlement agreement or court-ordered resolutions. The court can enter a divorce decree relatively soon in an uncontested divorce where parties agree to the terms of the divorce. Or, the court can enter a final decree based on the final disposition of the case, after the judge resolves disputes between parties, over property division and child custody. Once the judge orders a divorce decree, a court clerk enters the court order in the legal record and issues a copy of the divorce decree to each party. A divorce decree is the final chapter in a dissolution of marriage. The decree terminates the marriage, establishes a husband's and wife's obligations to one another and to their children and disposes of their property and debts. You may be able to obtain a sample of a final divorce decree from the website of the Virginia county courthouse where your divorce was filed. In an uncontested divorce, where the husband and wife have signed a settlement agreement, the final divorce decree is concise and straightforward.